Here we take a nostalgic look at something that Hereford fans will never ever see again, an FA Cup Second-Replay. In this Talking Bull Classic Match we go back in time to December 20th 1971, as non-league Hereford are on a momentous roll in the FA Cup but, after having drawn twice with Northampton Town, now faced a second replay at the Hawthorns – the home of West Bromwich Albion. Simon Wright was only 11 years old at the time, living in Hereford and supporting the local team. 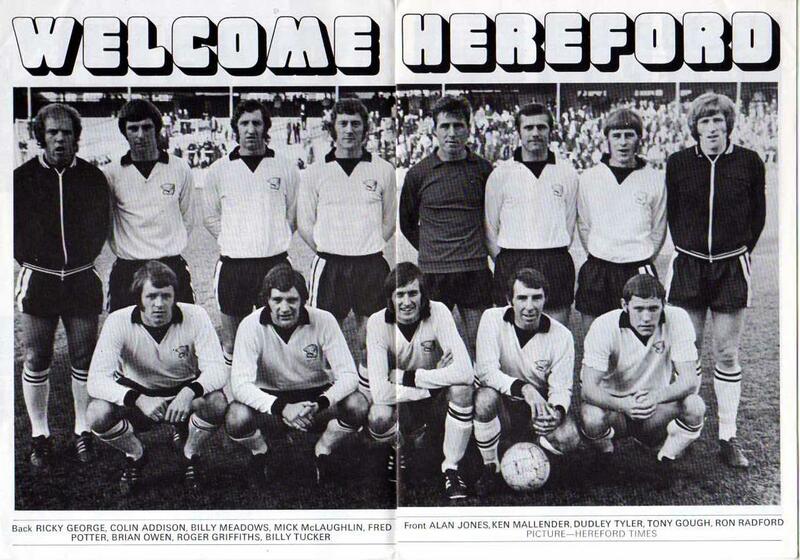 Back then Hereford regularly drew 5,000 home crowds for Southern League games. 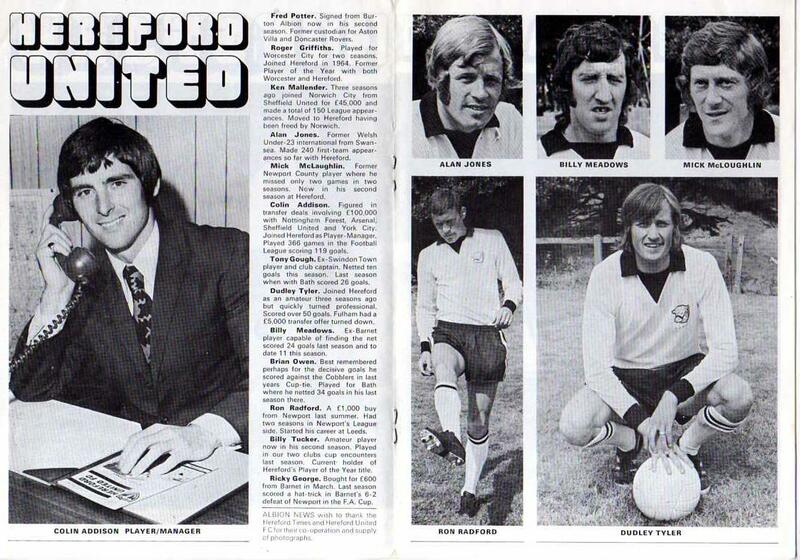 Indeed, the Bulls’ FA Cup 2nd round draw against Northampton at Edgar Street saw 9,500 fans inside the ground. The previous season, United had beaten Northampton in a replay, with the rivalry between the two clubs seemingly at breaking point. In the 1971/72 campaign the initial tie at Edgar Street ended in a 0-0 draw, whilst the replay at Northampton produced a 2-2 score line. So the second replay was to be at the Hawthorns with a trip to First Division Newcastle as the prize. All Herefords large firms laid on coaches for the trip and the local darts league postponed their matches so that as many fans as possible could travel. It was to be my first ever trip to a league ground. I remember the coach parking on a scrappy piece of land close to the Halfords Lane Throstle Club. The way in was through the turnstiles on the corner of Halfords Lane/Brummie Road, the turnstiles that terrace season ticket holders use. I felt uncomfortable and claustrophobic pushing through the gate. And the terraces! They were never ending and there were so few standing on them. To get as close to the action as possible I went down the front by myself, leaving my father and his friend standing about halfway back on the vast bank. At the front, my face was Just about above the wall. The whole ground seemed huge and I particularly remembered the large advertising hoardings suspended from the Smethwick End roof. I was very proud that I was actually inside a First Division ground. All the support that night was for Hereford. The neutral Albion followers must have all supported the underdogs because I cannot recall any Northampton songs at all. Northampton scored an early goal and hung on to it. Hereford just couldn’t break through. Alan Starling, the Northampton ‘keeper had a blinder. Every shot that was fired at him was blocked. Phil Neal, Northampton’s full back was kept busy by United’s flying winger Dudley Tyler. The closing minutes brought more frantic Hereford pressure and shots rained in but still Northampton held on. Injury time arrived with a scrimmage in the Northampton penalty area. Like a fairy tale up popped United full back Ken Mallender and the ball was in the net. The crowded Halfords Lane stand rose to a man. Now there was no stopping the Southern Leaguers. In extra time Starling did his best but finally Dudley Tyler tricked him and Hereford were in the lead. The exhausted Town had nothing left to give. So the match was won and I have recollections of tramping endless streets looking for an uncrowded pub, not for my benefit I hasten to add. After Hereford, the bare streets and the rubble strewn open spaces of West Bromwich appalled me and I said repeatedly I’ll never want to come here again’. I got that wrong, and I’ve supported both Hereford and the Baggies ever since!